Critics and fans laude DC for their animated movies and TV shows. When successful properties cross back over into comics, investors and collectors notice (i.e. Batman Adventures #12). Superman: The Animated Series (1996), like its Batman counterpart, spawned a popular crossover character: Livewire. Her comic book debut was in issue #5. This issue, clearly the most popular of the run, routinely tops $100 for a graded 9.8. (The issue sold 26,287 copies.) 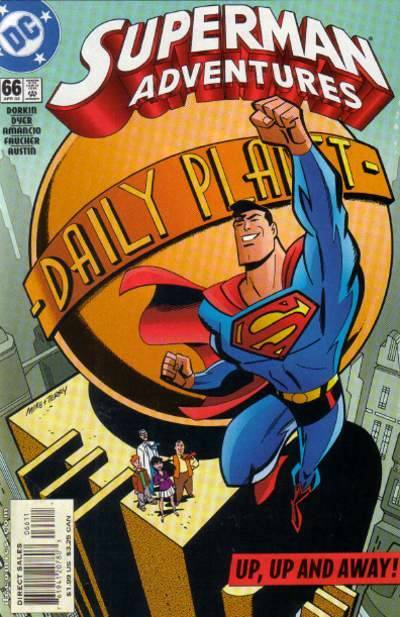 However, far rarer is Superman Adventures #66, the final issue of the series in 2002, written by Evan Dorkin and Sarah Dyer and penciled by Aluir Amancio. The issue, which features appearances by Livewire, Lex Luthor and Darkseid, sold only 9,178 copies according to Comichron. Furthermore, finding a graded 9.8 for sale is practically impossible, since there is only one graded copy in the CGC census and it’s a 9.8. Let’s repeat that, there is only ONE graded copy in the census. Prices for the comic online are across the board with Buy It Now listings for $24.99, $27.94, $55 and $99.94 for raw NM copies. Currently, the only actual sales were about $14 for copies in the VF range. The low print run, popular characters and scarcity of high grades make this a particularly attractive comic for investors. Snagged one from one of my sources for $15. Thanks for the tip! low print final issues of series are really fun to hunt for! This one is a great example. Ive looked a lot for that book so far I have only been able to find SA 64 and 65, but no 66. Its going to be like Spectre 54 where it will take money to bring them out.